I have been art journaling for several years now and I often journal about my faith, as well as Scripture. 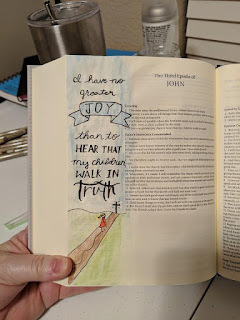 I have recently decided that I wanted to try my hand at Bible Journaling. The two art mediums are similar. So I bought a Journaling Bible that has wide margins for taking notes and/or drawing in. I began by looking at websites, YouTube videos, and photos on the internet. I already had a good number of tools as Art Journaling and Bible Journaling use virtually the same tools and supplies. As I was looking at ideas, I realized that I really only wanted to journal in the margin. I personally don't feel comfortable covering the Word of God in art, no matter how pretty. I've seen some really beautiful pages that do so, but it wasn't a comfortable thing for me. The first thing I did was to draw a blank rectangle template that was the size of the wide margin in my Journaling Bible. This would allow me to play with my design first and make sure it would fit in the margin correctly. I made several copies of this template so I can use it whenever I'm ready to design a page for my Bible. I created my design on the template and then transferred it into my Bible. The Bible's pages are thin enough so I could just copy it. After I got the copying completed, I colored it in with water colors. Below is a video I did live on Facebook of my transferring my design into my Bible. You can see the completed design at the top of the page. I have to say that I really enjoyed the process and I can't wait to do more of Bible Journaling. I haven't worked in this medium for over a year, so it was about time I got back into doing some of this because I really enjoy doing it.